Welcome to the club, Danger 5. I hadn’t even heard of this show until I saw it on my Netflix stream, and one fateful, boring night I decided to give it a chance. I suspected this was something special from the opening scene, when Nazi zeppelins (held up by visible strings), stole the Eiffel Tower as French onlookers were gunned down by a group of German soldiers – led by a talking dog puppet. I knew I was in love once I realized that was the least insane scene in the episode. 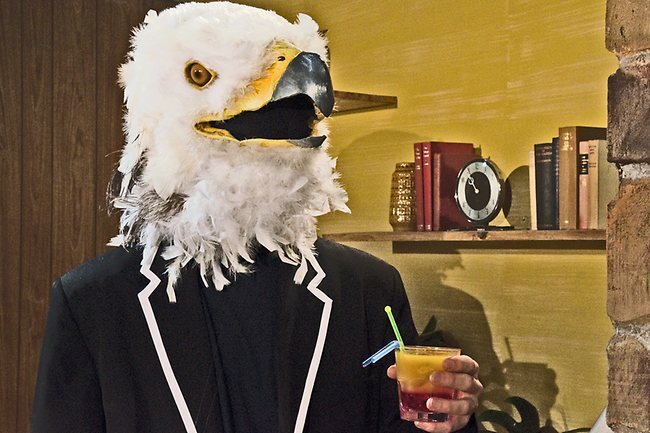 Danger 5 is an action comedy from Australia – home of fighting wine, spider paratroopers, and every deadly animal known to man. It’s World War II by way of the campiest bits from 60’s television, with special effects straight out of the Thunderbirds. The show follows an elite team of five international agents, given orders by a anthropomorphic bald eagle, as they tackle floating nations, dinosaurs, and giant robots in an attempt to kill Hitler. I’m not sure I can adequately describe how utterly batshit crazy this show is – or how fun it is to watch. The plots are nonsensical but oddly consistent, and the actors attack the material with a gusto that makes it all the more enjoyable. The humor is broad, subtle, and random – all at the same time. An egg-timer on the wrist lets one knock out enemies for the time he sets it to. Whenever someone gets shot they rasp out a mixed drink recipe to Pierre with their dying breath. And Ilsa, the Soviet member of the team, never speaks a word of English. Also, we find out that Stalin’s mustache doubled as a very comfortable lounge. So it’s not just funny, it’s educational. Series one is nearly pitch-perfect, which makes the downturn in series two all the more noticeable. The era moves from the 60’s to the 70’s (or 80’s – honestly, those decades were all a blur), and the team falls into the Britta Zone (for the non-Community lovers out there, I’m talking about characters becoming more one-dimensional as the series goes on). I’m not saying the season was a loss, or wasn’t funny. It just didn’t feel quite as fresh – or as perfect – as the first. If you like insane humor, then run (don’t walk) to your nearest streaming device and watch this show – at the very least for that magical first series.